Entrepreneur Craig Downs has combined product design, artificial intelligence (AI), smartphone technology and big data analysis to create an innovative running product. 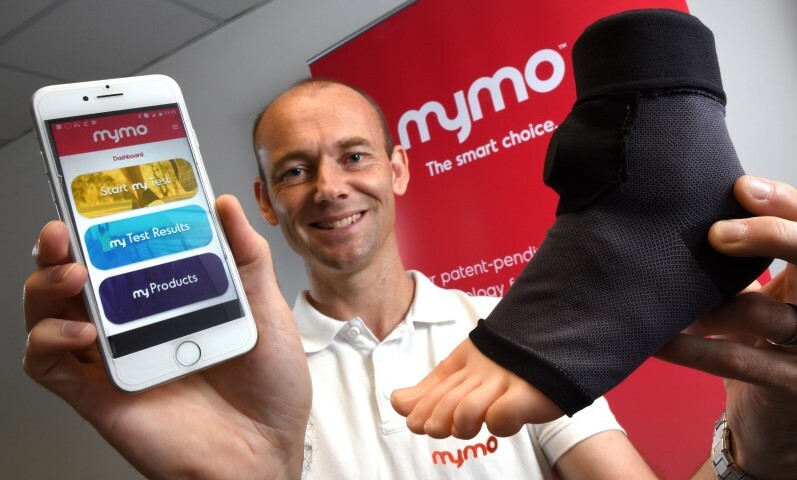 Craig’s company, Shoes2Run – based at The Hub in Washington, has developed a wearable product called mymo which uses AI to match a person’s gait to the latest running shoes on the market. Born out of his passion for running, he sought support from the North East Business and Innovation Centre (BIC) to help create a special sock that he believes could become a global success. He explained: “After suffering an injury by wearing inappropriate shoes, I wanted to make sure other runners didn’t experience the same problem. “So we have created this patent-pending innovation – knowing that no other company is currently providing unbiased footwear recommendations via this kind of technology. “And by collaborating with the BIC and various other organisations, we have developed a sock with embedded electronics that measures how the foot performs during a short walk, jog or running exercise. “The sock is worn barefoot to provide the most natural measurement and is controlled using your smartphone and analyses key metrics such as your foot strike pattern, degree of pronation and contact time. “The technology then provides an impartial and independent recommendation of the most suitable types of running shoes which can be filtered further by the user, helping them to make a much more informed choice but also giving them confidence they’re buying the correct type of shoe, which – in turn – minimises the risk of injury. Shoes2Run was supported by the BIC’s SME Innovation Programme which has received £820,439 of funding from the European Regional Development Fund as part of the European Structural and Investment Funds Growth Programme 2014-2020. Craig said: “The BIC’s Innovation Programme gave me invaluable support with funding and access to innovative expertise. “I worked with their Innovation Adviser, Gillian Middleton, who put me in touch with various organisations so I could access their networks and gain further business knowledge. Speaking on going forward, Craig added: “We will stay true to our roots and keep all production in the North East. We are working with a number of key organisations including Northumbria University on the development of the AI algorithm and Sunderland University for big data analysis. Craig is hoping to launch the product by the end of the year.